Note: Ensuring Equity in ESSA: The Role of N-Size in Subgroup Accountability, is no longer current and does not reflect state n-sizes implemented under the Every Student Succeeds Act (ESSA). For additional ESSA fact sheets, videos, and resources, visit all4ed.org/essa. This report recommends that states set their n-size as low as possible (ten or fewer students) to maximize the number of student subgroups created. 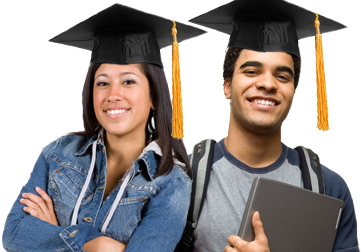 This will ensure that states identify student subgroups with low academic performance and/or low high school graduation rates and provide targeted interventions to support the schools those students attend. Specifically, states should not require a subgroup to include more than ten students in order to include that subgroup for reporting and accountability purposes. Download a letter signed by the Alliance for Excellent Education and more than thirty civil rights, disability, and data-focused organizations urging the U.S. Department of Education to decrease its proposed n-size threshold from thirty to ten in the final Every Student Succeeds Act accountability regulations. Greetings, what would be the impact of the proposed n-size on the number and percentage of students and schools that will not be part of accountability for the disability subgroup? There are studies supporting an n-size of 10 or lower at: https://nces.ed.gov/pubs2011/2011603.pdf and https://all4ed.org/wp-content/uploads/2016/06/NSize.pdf. Some states (e.g. Maryland) already have an n-size of 5, which has been determined to address both confidentiality and statistical reliability, the two reasons states argue for a higher n-size. 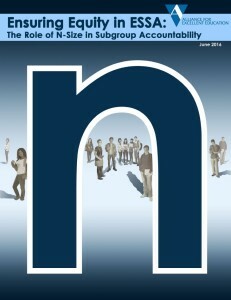 Please consider reducing the n-size subgroup to under 10. Accountability is key for ALL students. This would also help children with disabilities such as my son to receive the appropriate instruction in an inclusive setting. With the current n-size, of 40, educators find it extremely easy to overlook my son’s strengths showing zero accountability in curriculum design and multiple forms of representation.